"F4D" redirects here. For the F-4D Phantom, see McDonnell Douglas F-4 Phantom II. The Douglas F4D Skyray (later redesignated F-6 Skyray) is an American carrier-based fighter/interceptor built by the Douglas Aircraft Company. 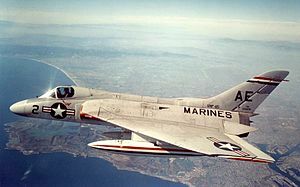 Although it was in service for a relatively short time (1956-1964) and never entered combat, it was the first carrier-launched aircraft to hold the world's absolute speed record, at 752.943 mph, and was the first United States Navy and United States Marine Corps fighter that could exceed Mach 1 in level flight. It was the last fighter produced by the Douglas Aircraft Company before it merged with McDonnell Aircraft and became McDonnell Douglas. The F5D Skylancer was an advanced development of the F4D Skyray that did not go into service. The XF4D-1 prototype aboard Coral Sea, in October 1953. The Skyray was designed to meet a Navy requirement issued in 1947 for a fighter aircraft that could intercept and destroy an enemy aircraft at an altitude of 50,000 ft (15,240 m) within five minutes of the alarm being sounded. The Navy also wanted an aircraft that followed the designs and research of the German aerodynamicist Alexander Lippisch, who moved to the U.S. after World War II. The F4D Skyray was a wide delta wing design with long, sharply swept, rounded wings. The design was named for its resemblance to the manta ray. The thick wing roots contained the air intakes feeding a single turbojet engine. Fuel was contained both in the wings and the deep fuselage. Leading edge slats were fitted for increased lift during takeoff and landing, while the trailing edges were mostly elevon control surfaces. Additional pitch trimmers were fitted inboard near the jet exhaust, and were locked upwards on takeoff and landing. The Westinghouse J40 turbojet was the intended powerplant, but Douglas took a conservative view and designed in contingency options for other power plants. The J40 proved troublesome and was eventually cancelled, and the Skyray was fitted instead with the Pratt & Whitney J57, a more powerful but larger engine. Production aircraft were not delivered until early 1956, while the United States Marine Corps received their first in 1957. In total, 419 F4D-1 (later designated F-6 in the unified designation system) aircraft were produced. Its unique design also played a part in making the Skyray one of the best-known early jet fighters. It was affectionately known as the "Ford" (after the "Four" and "D" of its designation). In 1953, Edward H. Heinemann was awarded the Collier Trophy in recognition of his design work on the F4D. A F4D-1 of VF(AW)-3 in flight over San Diego. In April 1956, VC-3 was the first squadron operational with the F4D-1. This unit was later redesignated VFAW-3 and assigned to NORAD, as the only United States Navy fighter squadron in what was predominantly a United States Air Force and Royal Canadian Air Force organization. VFAW-3 was permanently based at NAS North Island in San Diego. The U.S. Marine Corps also flew the Skyray. 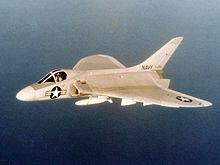 When the Department of Defense adopted a uniform aircraft designation system patterned on the U.S. Air Force aircraft designation system in September 1962, the F4D was redesignated as the F-6A Skyray. In addition to multiple Navy and Marine Corps squadrons, Naval Air Reserve and Marine Air Reserve squadrons VF-881, VF-882 and VMF-215 also flew the Skyray. The last operational squadron was VMF(AW)-115, which flew the Skyray until February 1964. The Skyray was designed exclusively for the high-altitude interception role, with a high rate and angle of climb. It set a new time-to-altitude record, flying from a standing start to 49,221 feet (15,003 m) in 2 minutes and 36 seconds, all while flying at a 70° pitch angle. 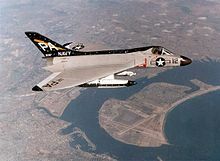 As a dedicated interceptor, the F4D was unsuited to the multi-mission capabilities soon in demand, so it had a short career in Navy and Marine Corps service, the last aircraft being withdrawn from service in 1964. Four aircraft were used by NACA (soon to be NASA) until 1969. Under the new 1962 United States Tri-Service aircraft designation system, the F4D-1 was redesignated the F-6A. 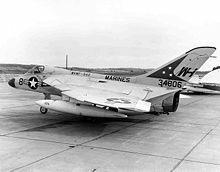 The F4D (old designation) should not be confused with the F-4D (new designation) – the latter being the "D" variant of the McDonnell Douglas F-4 Phantom II operated by the U.S. Air Force. 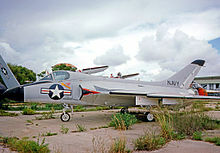 The F5D Skylancer was derived from the F4D and intended to be a Mach 2 capable successor to the Skyray. Although four prototypes were built and flown, the project was cancelled as being too similar in mission parameters to the F8U Crusader and also to reduce dependence upon Douglas Aircraft, which was also producing several other aircraft for the U.S. Navy. Single-seat fighter aircraft, production model redesignated F-6A in 1962, 420 built. Re-engined F4D-1 with the J57-F-14, 100 on order cancelled. F4D-2 version with extended nose housing twin radar scanners, project only evolved into the F5D Skylancer. XF4D-1 prototypes redesignated in 1962. US Navy F-6A Skyray 134806 on display at the NMNA at NAS Pensacola, Florida in 1975. This aircraft is fully restored and now displayed inside the museum building that was completed in 1975. 124587 - U.S. Naval Museum of Armament and Technology at Naval Air Weapons Station China Lake, California. 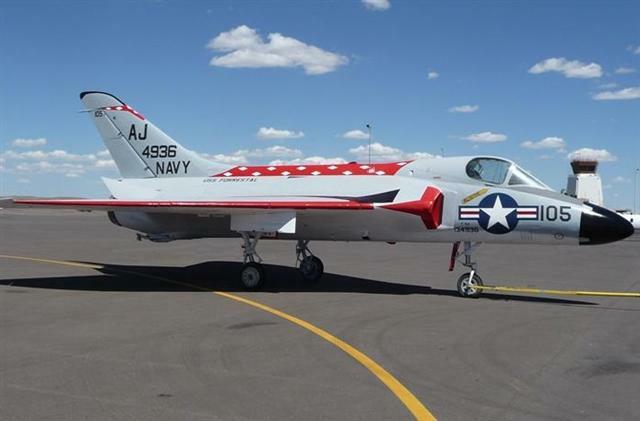 It is on loan from the National Naval Aviation Museum, Naval Air Station Pensacola, Florida. 134748 - Pima Air and Space Museum adjacent to Davis-Monthan Air Force Base in Tucson, Arizona. It is on loan from the National Naval Aviation Museum. 134764 - Naval Air Station Patuxent River in St. Mary's County, Maryland. It is on loan from the National Naval Aviation Museum. 134806 - National Naval Aviation Museum at Naval Air Station Pensacola, Florida. 134836 - New England Air Museum in Windsor Locks, Connecticut. 134936 - Pueblo Weisbrod Aircraft Museum at Pueblo Memorial Airport, Colorado. 134950 - Aviation Heritage Park at Naval Air Station Oceana in Virginia Beach, Virginia. It is on loan from the National Naval Aviation Museum. 139177 - Flying Leatherneck Aviation Museum at Marine Corps Air Station Miramar in San Diego, California. It is on loan from the National Naval Aviation Museum. ^ a b c d Angelluci 1987, p. 92. ^ Francillon 1979, p. 480. ^ Angelluci 1987, p. 91. ^ Gunston 1981, p. 67. ^ Gunston 1981, p. 70. ^ "Collier Trophy awards." Archived 11 December 2008 at the Wayback Machine National Aeronautic Association. Retrieved: 27 February 2008. ^ a b Gunston 1981, p. 73. ^ "F4D Skyray/124587." warbirdregistry.org Retrieved: 26 October 2012. ^ "F4D Skyray/134748." Pima Air and Space Museum. Retrieved: 27 January 2015. ^ "F4D Skyray/134764." aerialvisuals.ca Retrieved: 27 January 2015. ^ "F4D Skyray/134806." National Naval Aviation Museum. Retrieved: 27 January 2015. ^ "F4D Skyray/134836." New England Air Museum. Retrieved: 26 October 2012. ^ "F-4D Skyray/134936." Archived 30 October 2013 at the Wayback Machine Pueblo Weisbrod Aircraft Museum. Retrieved: 29 February 2008. ^ "F4D Skyray/134950." aerialvisuals.ca Retrieved: 27 January 2015. ^ "F4D Skyray/139177." Flying Leatherneck Aviation Museum. Retrieved: 27 January 2015. Frankel, Mark. 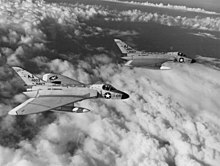 Killer Rays: The Story of the Douglas F4D Skyray and F5D Skylancer. North Branch, Minnesota: Specialty Press, 2010. ISBN 978-1-58007-155-0. Posey, Carl. "Beautiful Climber". Air & Space, June–July 2006. Williams, Nick and Steve Ginter. Douglas F4D Skyray, Naval Fighters No. 13. Simi Valley, California: Ginter Books, 1986. ISBN 0-942612-13-2. Winchester, Jim. Fighter: The World's Finest Combat Aircraft, 1913 to the Present Day. New York: Barnes & Noble Publishing, Inc. and Parragon Publishing, 2006. ISBN 0-7607-7957-0. Roux, Élodie (2007). Turbofan and turbojet engines: database handbook. Ed. Elodie Roux. ISBN 978-2-9529380-1-3. Retrieved 28 January 2019. Wikimedia Commons has media related to Douglas F4D Skyray.